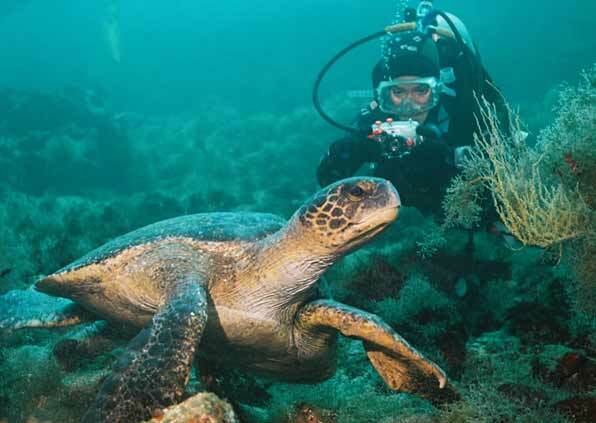 The Galapagos Islands were chosen by Rodale's Scuba Diving as the world's top all around dive site for the year 2000. The Islands were also chosen for the top spot in "Best Fish Life", "Best Big Animal Dive", "Best Advanced Diving" and scored among the top as the "Healthiest Marine Environment", and "Best Value". Most people book their Galapagos diving trip as a complete package on a live-aboard boat, although trips based out of Puerto Ayora offer consistent quality guides and safety standards. Good diving all year, but June-December is exceptional. Whales, Hammerheads, rays and other big stuff come out to play. Darwin & Wolf Islands are out-of-this-world because of the increased chance of seeing Whale Sharks and huge schools of hammerheads. Gordon Rocks site is where diving in a volcanic crater brings you up close and personal with hammerheads, rays, and Galapagos sharks. Dive packages are the best way to go for live-aboards. Companies will take care of your needs from A to Z. Check out hotel-based tours and combined diving and land tours for better accommodation and availability. Daily dive trips and packages from Santa Cruz and San Cristobal allow you access to the wealth of marine life in the Galapagos Islands. The costs of Live Aboards is the same year-round. From April to May and September to October, the air fare to and from the mainland of Ecuador often decreases slightly. All diving tours in Galapagos Islands .com are coordinated by diving guides who are licensed by the Galapagos National Park Service and are highly knowledgeable about the underwater wonders of the Galapagos.